The Ancient Egyptian civilisation was one of the first, if not indeed the first, to go beyond the mere pictorial representation of events and to develop some kind of writing. The oldest known samples of Ancient Egyptian writing were discovered in Abydos and are dated to 3.100 BC or before. They are the oldest samples of writing known to mankind up to now. 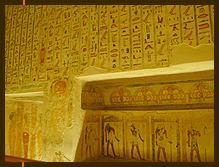 Coloured hieroglyphs from a royal tomb at the Valley of the Kings. Throughout their more than 3.000 year long history, the Ancient Egyptians developed and used three kinds of writing: hieroglyphic, hieratic and demotic. The writing most commonly associated with the Ancient Egyptians is called hieroglyphic, a name that comes from the Greek words hieros (sacred) and glypho (inscription). It consists of a large variety of images representing sounds as well as ideas and actions. The images were normally clearly drawn, although the amount of detail would depend on such matters as the size of the signs, the available time to actually write the texts, and personal taste. Thus the quality of writing can vary from exquisitely carved signs to clumsily drawn ink marks. The entire scene symbolises the unity of Upper- and Lower-Egypt. Its versatile nature allowed it to be written in rows or in columns, oriented from right to left or from left to right. All signs are normally positioned as if looking towards the beginning of the text. Just how versatile this orientation was, is shown in the many temple reliefs that show a king facing one or more gods. The texts share the orientation of the representations they accompany and like the king faces the gods, so do their respective texts. Hieroglyphic writing was used from the end of Prehistory, until 396 AD, when the last hieroglyphic text was written on the walls of the temple of Isis on the island Philae. It was used in many different situations; for monumental inscriptions on walls of temples and tombs, on furniture, statues, papyrus, jewellery, sarcophagi and coffins, amongst others. It could either be carved into a hard surface, or written in ink. In time, its use would become more and more restricted to religious texts on temples or in tombs, or to official royal decrees. The earliest known examples of hieratic are only slightly more recent than hieroglyphic. It is a more cursive form of hieroglyphic, the result of quickly drawing signs by hand on a sheet of papyrus with a reed brush. Here the original hieroglyphic signs were reduced to their simplest form. Some common signs could even be reduced to a simple stroke, smaller signs would become mere dots or would be combined into one new sign. Being handwriting, hieratic would change and evolve over time. The hieroglyphic basis of hieratic would, however, always remain present. Most hieratic texts are therefore transcribed into hieroglyphic by modern-day researchers. Hieratic was originally mainly used in administrative texts, but because it was more practical and less time-consuming than hieroglyphics, it found its way into literature, wisdom texts and even religious writings. 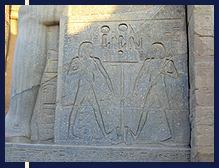 From the 25th/26th Dynasty on, its use would become more and more restricted to religious texts. It was normally written using a reed brush on sheets of papyrus, but hieratic writing is also seen on tissues, pieces of cloth, and occasionally on other substrates. Like hieroglyphic writing, it could originally be written in rows or columns. In time, however, the writing orientation would become standardised and hieratic would only be written in rows from right to left. Demotic evolved from an even more cursive form of hieratic and became the standard for the administration from the 25th or 26th Dynasty on. Contrary to hieratic, demotic texts are normally not transcribed into hieroglyphics prior to translation because it is often impossible to relate a demotic sign to a hieroglyphic counterpart. Sometimes one hieroglyphic sign would be written as a group of demotic signs; or a group of hieroglyphic signs would merge into one single demotic sign. 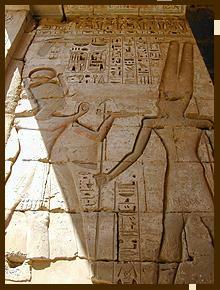 Deeply carved hieroglyphs in the temple of Ramesses III at Medinet Habu. The text is part of the ritual scene where the king, burns some incense for Amun-Ra. The variety of possible readings for one single demotic sign is far greater than with any hieroglyphic sign. As a further evolution of hieratic, demotic was only written in rows from right to left. Older demotic texts were written with a reed brush, but from the Ptolemaic era on, the reed pen would be favoured. Demotic was mostly used for administrative and private texts, but also for some stories and quite exceptionally in inscriptions. The last known demotic text is an inscription in the temple of Philae, dated to the 5th century AD. It is important to note that no single type of writing would entirely replace another, but it would merely restrict the other writings to specific domains and be restricted itself to other domains. Thus demotic would become the writing of the administration from the 26th Dynasty on, but it did not entirely replace hieratic as a handwriting, which was still being used in religious texts. Hieratic, on its part, did not replace hieroglyphic either. From its beginnings it was hieroglyphic, but more cursive, and written by a speedier hand than hieroglyphic. As the two writings evolved, practicality caused hieratic to be used when a text need not be written in the slow but detailed hieroglyphic signs. Therefore hieratic was used in such contexts as administrative texts; texts that were not to be inscribed on monuments or funerary objects and texts that mattered for their contents only.